PW transformers are fine for PW equipment. For modern engines with PC boards the breaker trip is so slow it can be measured with a stop watch. A faster acting fuse or circuit breaker can be installed,in this case I opted for a breaker. Mouser.com P/N 655-w-28-XQ1A-10. many others can be used. It is wired in series with the center rail tap. Regardless of transformers used spike protection is also recommended. A TVS wired across the transformer terminal,A-U on a ZW for example will hopefully conduct spikes harmlessly to common. The TVS selected is Mouser.com part # 576-1.5KE36CA. Barrier strips are used to make connections. 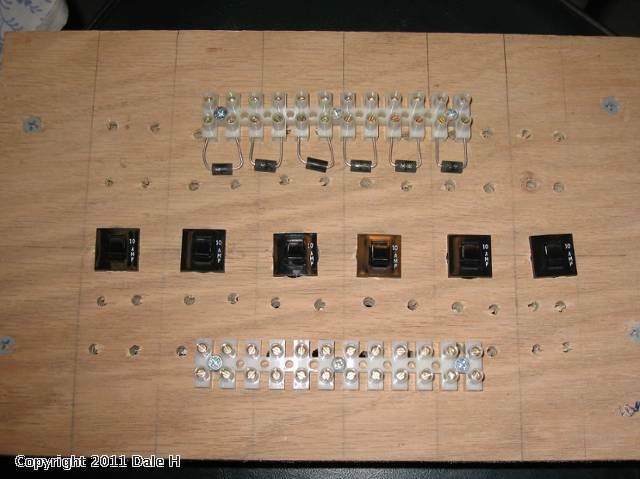 Here are parts for 6 circuits,the 3/4 plywood is for mounting. The parts are placed on the boards,the barrier strips screwed down,the TVS units across the strip. Holes are drilled for the breakers and they are glued into place with silicone rubber cement.16 gauge wire is soldered to the breaker terminals on the reverse side. No pretty but functional and cheap. The parts for 6 circuits cost $21. The ZW terminals go in through the circuit and come out with breaker and spike protection to each loop. 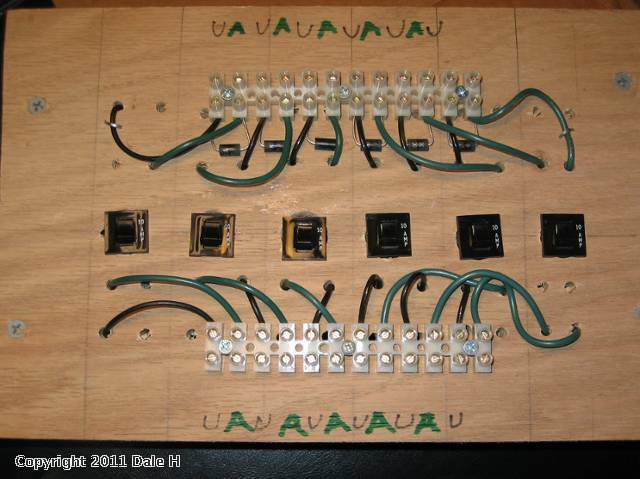 An external bell and whistle controller could also be added using 6 amp diodes and barrier strips. See post in electrical section here. does it matter how you wire the TVS between the leads? No it is bidirectional,wired across AC leads. 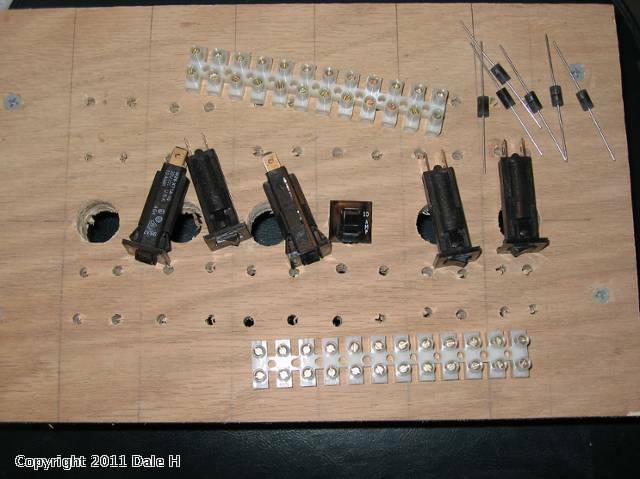 Dale - since frying a TIU, I put 10a inline microfuses between my transformer and TIU, or in the case of the Lionel side between the PowerHouse and track. When something shorts, these fuses always blow first, which to me this is good, but crawling under the table to replace fuses stinks. I have two separate power sources: Z-4000 to the TIU for MTH tracks and PowerHouse to the track for Lionel tracks. With this setup, can I effectively directly replace my inline fuses with the cb-010 breakers or do I really need to do the TVS stuff as well. If so, do you have a part number for the appropriate TVS at www.allelectronics.com so I can buy everything on one order? I do not know if allelectronics has the TVS,I purchased mine from Mouser and the breakers from Allelectronics. The MTH TIU has a TVS in it. The circuit here was for a guy running a PWZW conventional. 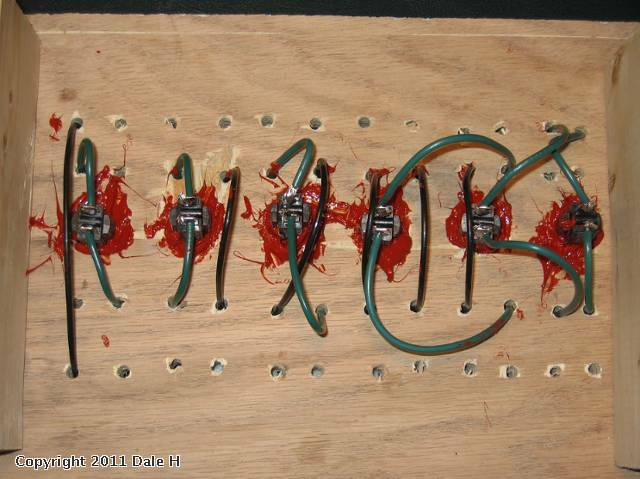 I do not run DCS but I would recommend putting extra ones on the track loop,anywhere across the center rail and an outside rail,soldered or otherwise connected.. The TVS has a very small capacitance but I do not think enough to mess up the DCS signal. A second path for a spike on a loop is not a bad idea IMO,might take some of the heat out of the one in the TIU which I have seen pictures of fried to a crisp. However the added TVS is optional. . The breakers are not as fast as a fuse but should offer adequate protection but this is not easy to verify for sure. Thanks for the great information here. I dont really understand this however since i will be using mulitple KW's on both older and newer engines looks like a smart thing to do. The photos help but is there a wiring diagram available? This would help me to understand the circuits and what I need to buy. Where did you find the barrier strips? Not really understanding this. Any chance for a wire diagram? Barrier strips are from www.Allelectronics.com. Radio Shack also sells them but they are more expensive. From A-U of a PWZW. The TVS goes across the AU just as if you were shorting it out. From there the U terminal wire (black in the picture) goes to the outside rail of the loop. The A terminal wire (green in the picture) then goes to one lead of the circuit breaker. A wire from the other lead of the circuit breaker (green in the picture) goes to the center track rail. The barrier strips allow for easy no solder connections. The pic shows parts for 6 loops.